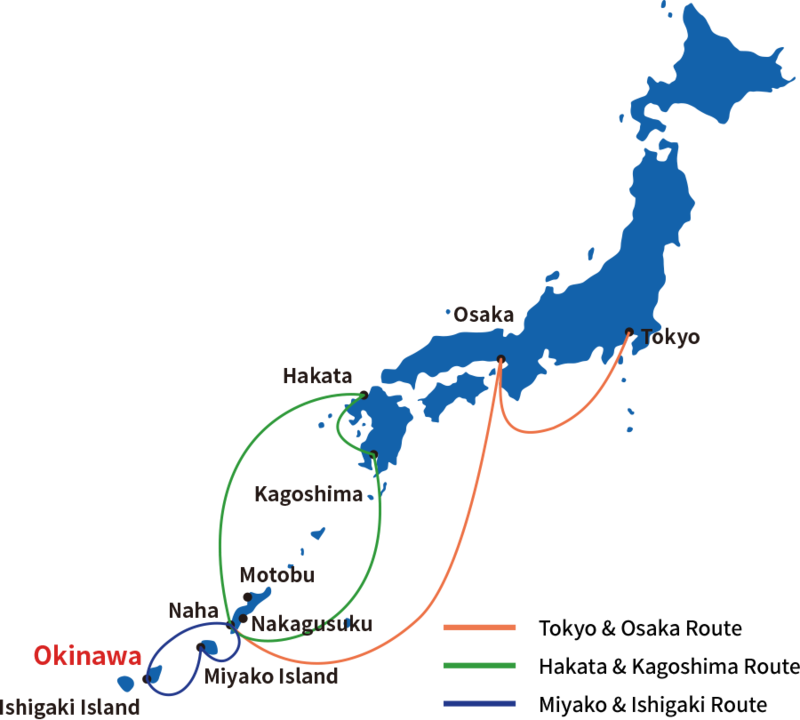 Of the carriers assigned to the Okinawa route, RKK Line capitalizes on its location with bases at key mainland Japan ports to provide excellent maritime transport. 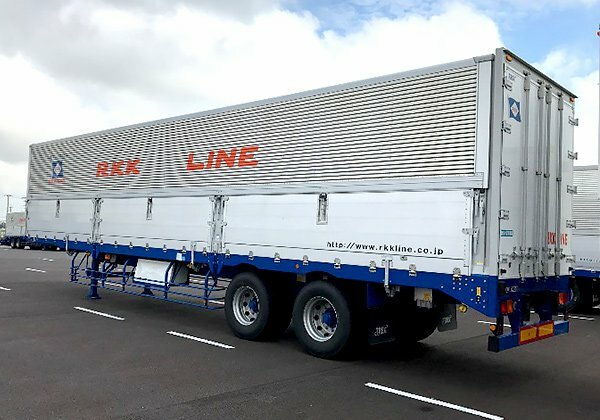 In addition to transport, RKK Line Group companies provide mainland cargo collection, stockpiling and distribution in our effort to realize the finest door-to-door service. Along all routes, RKK Line has built a total logistics system that utilize our warehouses and network of group companies. Centralization of cargo data has allowed us to integrate transport and succeed in cutting costs by eliminating margins taken by middlemen. We have also reduced the risk of misdelivery, stockouts and other such risks, increased delivery speed and accuracy, and even eased our shipping tariffs. Another excellent feature of RKK Line is the significant advantage that we offer in terms of connectedness. 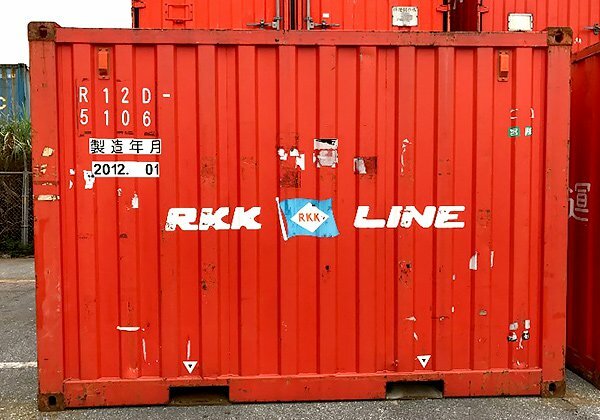 RKK Line operates six RORO ships including the largest class vessel in Okinawa Prefecture. 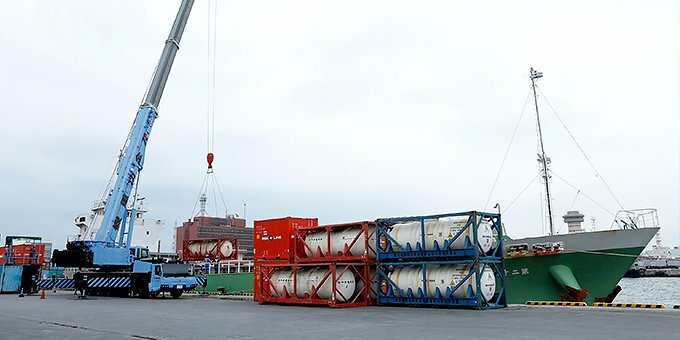 We connect Naha, Kagoshima, Hakata, Osaka and Tokyo, transporting many types of cargo ranging from general-purpose products to automobiles. Our RORO ships are equipped with power outlets so that we may also handle freezer and refrigerator containers. Select location of departure port. Select location of arrival port. Times will be displayed for the departure and arrival ports. There are currently no scheduled arrivals. ※Cargo transfer will take place at Naha. Please check the vessel schedule here. If any urgent changes are made due to inclement weather or other reason, notice will be posted on the Operation information page. 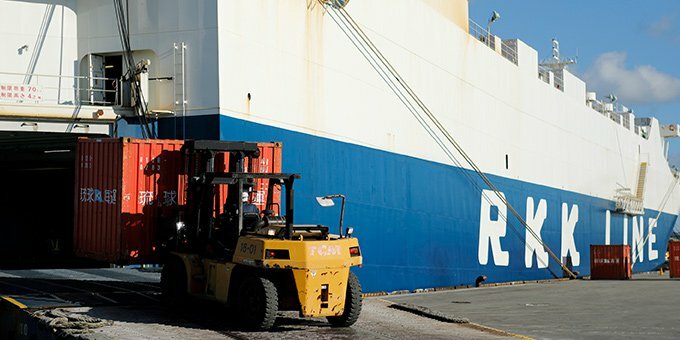 RORO ship is the abbreviation for a vessel where cargo is loaded and unloaded using the “roll on, roll off” method. In contrast to container ships, RORO ships carry trucks and trailers loaded with cargo, and these vehicles are driven onto and off of the ship. This allows for quick cargo loading with little impact (damage) to the cargo, and is well suited for transporting perishable foods and value-added products. 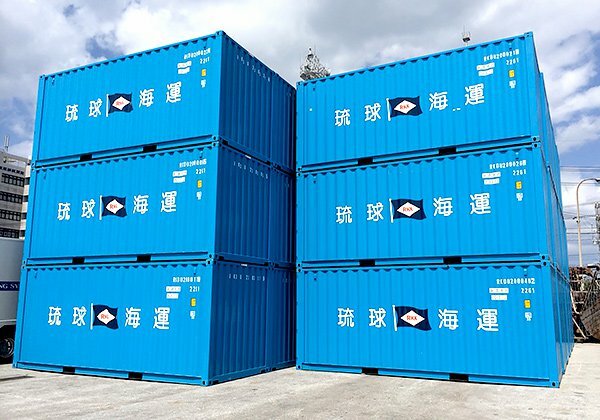 In addition, our ships are equipped with 220V and 440V power outlets, enabling reefer (freezer and refrigerator) containers to be transported as well. 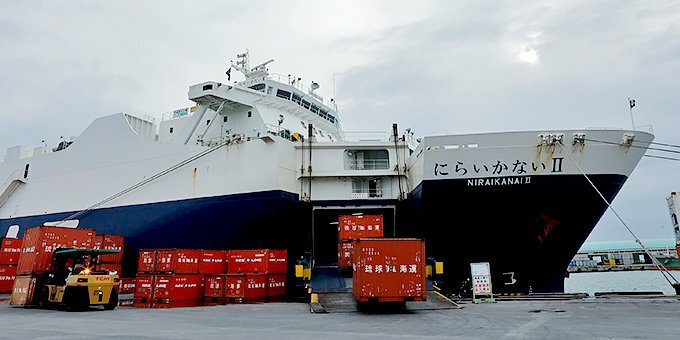 RKK Line also has the capability to operate vessels at any port throughout Japan from Hokkaido to the outlying islands in Okinawa Prefecture. We offer charters with a ship transporting loads of up to 1,500 tons. We handle a variety of cargo from refined sugar, leaf tobacco, barley, wheat, fertilizer to large plants. We have even transported Shinkansen rolling stock and utility poles. RKK Line has ample numbers and types of containers, chassis and other transport equipment that we can tailor to your shipping needs. We even handle reefer containers for chilled and frozen cargo. A PDF of our Conditions of Domestic Carriage is available here.